we are glad to share good comments from our guests. 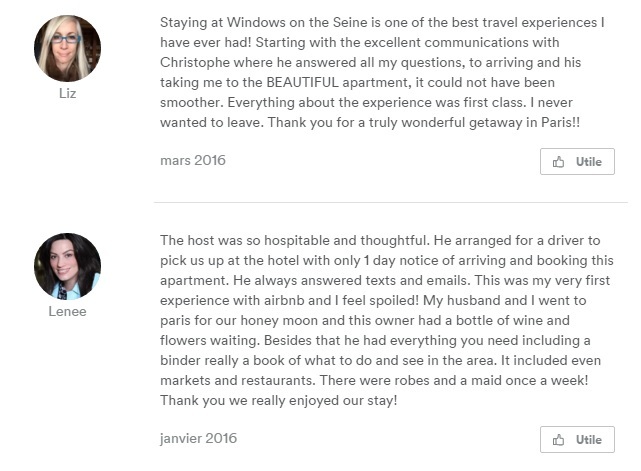 Let's read reviews about our Paris vacation apartments rental bellow. We look forward to host you in the City of Lights for your next holiday. "Best travel experience" – "BEAUTIFUL APARTMENT" – "The experience was first class"
"The host was so hospitable and thoughtful." It was a pleasure meeting you. And it is certainly a pleasure to say how wonderful our stay in the Nympheas apartment was. It turned out to be exactly as depicted on the website, with wonderful views over the Seine to the lower Marais (an enjoyable part of our stay was exploring the Village St-Paul and rue François Miron neighborhoods so close to the apartment). The living room and dining room were large and comfortable, the kitchen well-equipped, the bedrooms luxurious, the building well-maintained and quiet. All was spotlessly clean and the linens and towels generously supplied. The mid-week cleaning was an unexpected bonus. The apartment could not be better located and your suggestions both in person and in the binder in the apartment provided an insider's view of the city. Thank you also for printing out the receipt for the concert tickets. I must also compliment you on the airport transport service, Julien was a wonderful driver. My only regret is that our stay was far too short!
" Dear Christophe, Heather and I had a wonderful trip to Paris, and we owe much of that to you and the rest of your staff at Guest Apartment Services. 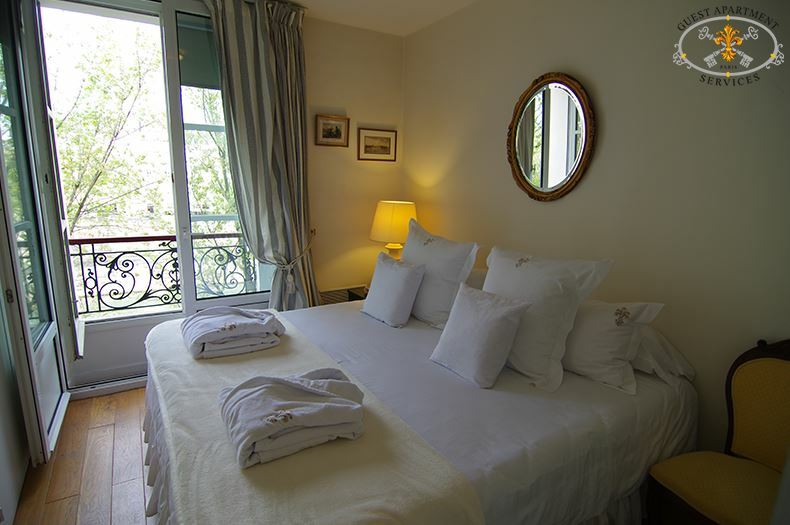 We enjoyed our stay at the Windows on Seine apartment that you graciously let us change to. We loved how everything in the apartment was brand-new and we think that it was in a more quiet area of Ile Saint Louis than the Hibiscus apartment that we originally booked. Having you set-up a private driver to take us to and from the airport was a real luxury that made things easy for us and both drivers were very nice. I did want to let you know just a few things: we never managed to get the towel warmer to work – so it may not be functioning. Also, there are small black specs of material that collect on the back portion of the kitchen counter – it looks like they fall through a small crack that has not been caulked where the cabinet meets the wall, right above where the cooktop is located. Again, thank you very much for helping to make our trip an enjoyable experience and please pass-on our thanks to your staff who helped us as well. 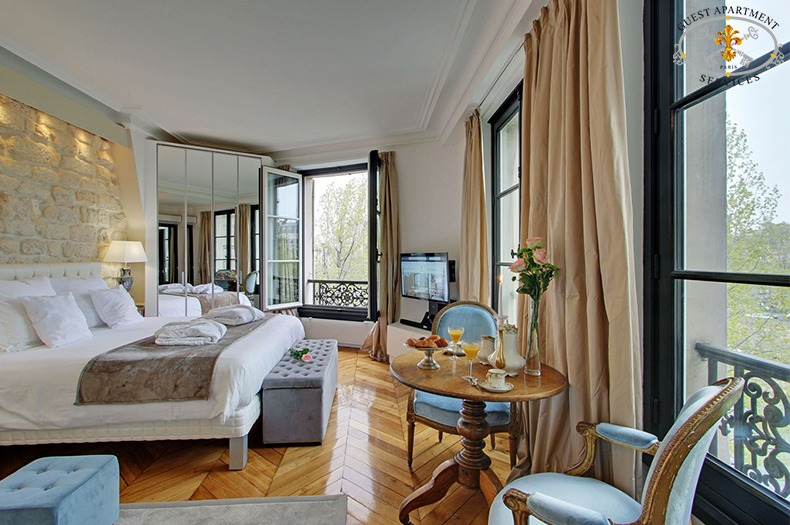 We will most definitely recommend Guest Apartment Services to any of our friends who are planning a trip to Paris. Merci Beaucoup!